Back in May, we had the pleasure speak and exhibit at a gathering of UK’s NMI (National Microelectronics Institute) titled: ‘FPGA: What next after flicking the switch?’. The topic of the day was all about what happened after we get to download a design into a live FPGA. When we release Reset and hold our breath… ? Why is FPGA verification different from ASIC/SoC verification? 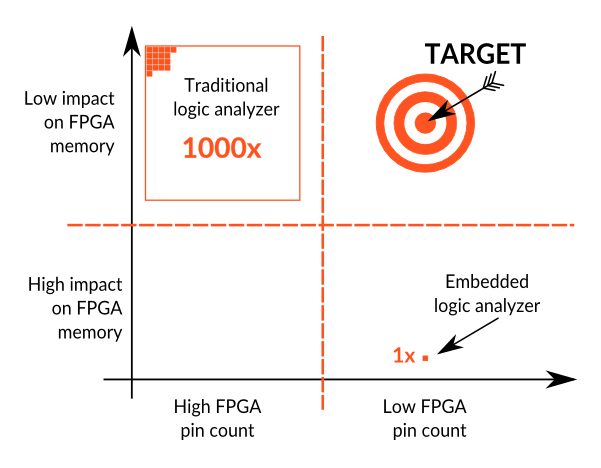 There is a common theme in the verification world that FPGA designers play too fast and loose, and that they don’t have proper respect for the verification process. IC designers have enormous verification budgets, capable teams, and sophisticated tools. The simple truth is that fear, not design complexity, drives the advancement of advanced verification methodologies. Without the fear of loosing a gigantic amount of money if an ASIC is not properly verified and debugged, the EDA industry wouldn’t be able to produce (and sell!) all the advanced technologies used by ASIC and SoC designers today. Like I said in a previous post: ‘It is a question of economics’. Does this mean that there is no innovation in the FPGA design flow? At Exostiv Labs, we are convinced that FPGA design is different from ASIC and SoC design. For that reason, the FPGA design flow must be improved with tools, software and methodologies dedicated to FPGA. Attempting to use ASIC and SoC tools as ‘out of the box’ solutions for FPGA is the clear path to misfits and frustrations. In order to get to know better about your specific aspirations in FPGA design, verification and debug, we invite you this month to take a short survey. We’d be very happy if you could spend 5 minutes on it. If you participate and enter your contact information, you’ll have a chance to win a $100 Amazon gift card. I recently attended a technical seminar organized in The Netherlands by one of the major FPGA vendors (hint: it is one of the 2 top vendors among the ‘4 + now single outsider’ players in the very stable FPGA market). During the lunch, I had the opportunity to discuss with some engineers about FPGA verification. Beyond high-level definition techniques, simulation and other ‘pure-software’ techniques, they all used ‘real hardware’ for some of their verification iterations. There seems to be a strongly entrenched habit of the FPGA engineer: we cannot resist to the appeal of being able to reconfigure the FPGA indefinitely and try a system ‘for real’. Yet, for those who would still believe it, the days of simply throwing a design to a board without prior verification are over and for good (check this article for instance). 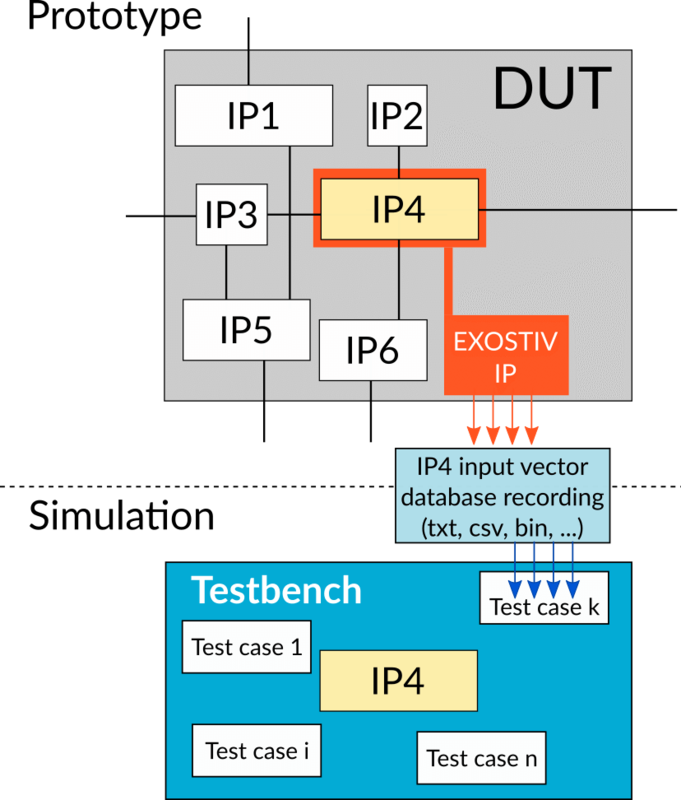 Separate IPs and separate groups of ‘functionally-coherent’ IPs really go through all-kinds of pre-hardware validations. Like one of my lunch companions said: ‘This is when we put things together for real that virtually *anything* can go wrong.’. So FPGA Engineers like to go on real hardware for debug. When asked about what they use at this stage of the design flow, the answers are (unsurprisingly?) similar. Two techniques still prevail: either they connect a logic analyzer to some of the FPGA’s I/Os – or they use an ’embedded logic analyzer’. Schematically, using a traditional logic analyzer to debug FPGA consists in making a special FPGA configuration where internal nodes are routed onto some of the chip’s functional I/Os. These I/Os are ‘physically’ routed on board to a connector on which the logic analyzer can be hooked. This approach uses the ability to reconfigure the FPGA to route diverse groups of internal nodes to the same set of physical I/Os. Multiplexing groups of nodes helps reducing the number of FPGA synthesis & implementation iterations. The observed nodes evolution is stored into the logic analyzer’s memory for further analysis. Conversely, using an embedded logic analyzer consists in reserving FPGA memory resources for storing the FPGA nodes evolution. Subsequently, this memory is read by using the device’s JTAG port. The collected traces can be visualized on a PC – usually in a waveform viewer software. This is a usual trade-off between which resources you are able to mobilize for debug and the achievable debug goals. The embedded logic analyzer is generally preferred because it does not reserve FPGA I/Os for debug. Having a sufficient number of such I/Os for debug can lead to choosing a more costly device ‘only for debug’ – which usually proves to be difficult to ask to your manager. Conversely, the traditional logic analyzer is preferred over the embedded logic analyzer because of its larger trace storage (Mega samples vs. Kilo samples). – With FPGA commonly running at more than 350 MHz, signal integrity and PCB costs problems arise when routing a large number of I/Os to a debug connector (trace length matching, power and space issues). This goes in favor of the embedded logic analyzer (not speaking of the much larger price of a traditional logic analyzer). – In my previous post, I evoked the gap that may exist between the order of magnitude of the memory that’s available in a FPGA and the quantity of data that is necessary for debugging efficiently. Supposing that none of the above techniques is satisfactory, how can they be improved? The picture below shows the relative positions of the logic analyzer and the embedded logic analyzers on a 2 axis chart. It shows the FPGA I/O and memory resources that have to be mobilized by each technique. The area occupied by each solution shows the relative order of magnitude of the trace memory they provide – which is a good measure of the provided ‘observability’. In my next post, I’ll come back on the impact of reaching the target defined above. Stay tuned. So here we are. Exostiv Labs has started. Those of you who are familiar with Byte Paradigm (www.byteparadigm.com) already know that we have 10 years of business behind us. Quite some time dedicated to FPGA & System design AND Test and Measurement. So, why Exostiv Labs – what is it and why now? Exostiv Labs focuses on providing innovative debug & verification tools to the FPGA design community. We believe that FPGA (or Programmable Logic, ‘HIPPS’, or whatever they are called) has got its own constraints and economics. FPGA has become one of the most complex type of chip available for digital systems. Yet, the tools provided to the FPGA engineering community have failed to scale with the FPGA technology. 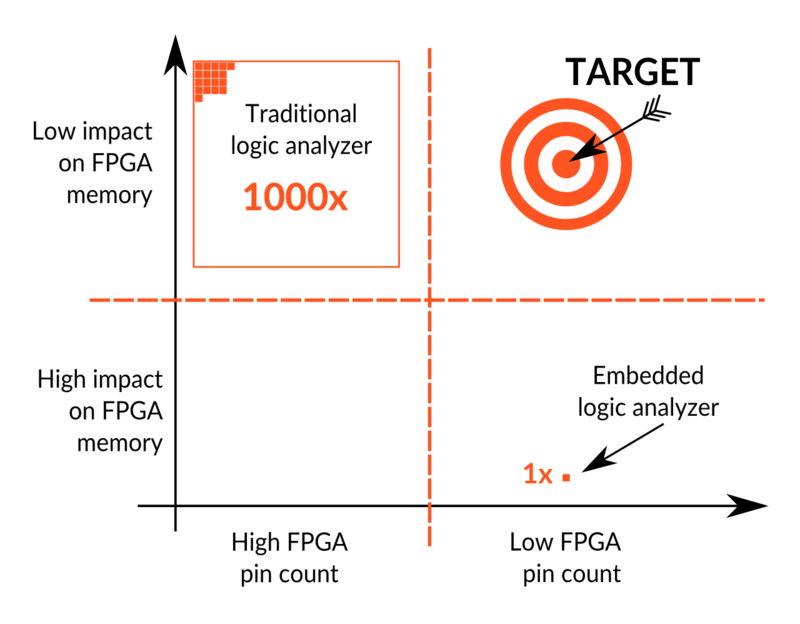 The first and main problem in FPGA debug is observability– that is, the ability to understand the system’s behaviour from what you can observe of it. Observability is in the roots of Exostiv Labs. We choose our name to reflect what we think is biggest issue of FPGA debug: visibility and the need to see more – ultimately everything. The other questions are more extensively developed in our latest white paper ‘FPGA verification tools need an upgrade’. You can download it from the link below. Download White Paper – ‘FPGA verification tools need an upgrade’ (PDF).